One thing general manager Marc Bergevin has been adamant about since the beginning of his tenure in Montreal is that you can never have too much depth. Well, he’s wrong; there is such a thing as too much depth. Given Montreal’s situation on defence and their bottom six, the amount of depth signings/trades made by the the Canadiens’ GM is and has been stunting the growth of some skilled prospects. Let’s start with the forwards. Looking at Montreal’s forward lineup compared to a few years ago, he’s replaced some dead-weight players such as Brandon Prust, Travis Moen, Colby Armstrong, Ryan White and Jeff Halpern with other players who although at the time were probably better, were still on the decline. Torrey Mitchell and Brian Flynn come to mind back in 2015. And then this past year he added more third and fourth line grinders such as Dwight King, Andreas Martinsen and then Steve Ott. Those are just a few examples over the past couple years. It’s evident that Bergevin is more willing to pay a price for other teams’ third and fourth line players rather than use what is at his disposal in the AHL. Seeing as Bergevin and Sylvain Lefebvre have only been able to graduate just one full time AHLer in the last five years (Nathan Beaulieu), you would think that they would put more effort in developing their young players. There are a few players who come to mind who have been constantly waiting in the shadows of those less skilled. Charles Hudon is the first one, a player who dominated the American Hockey League for the past four seasons, consistently putting up 40-50 point seasons despite playing for a highly conservative coach. Through only four NHL games, which for Hudon adds up to approximately 60 minutes, the 23 year old has four assists. Small sample size? Of course, but there’s nothing that suggests Hudon can’t produce at the NHL level. Even at the annual intrasquad scrimmage at the Bell Centre, Hudon put two goals on Tomas Plekanec’s stick and then another on the stick of Mark Streit, which ended up being the overtime winner. He scored again in a preseason match vs Washington as well. There is some speculation that part of the reason Bergevin and company didn’t give the offensive spark plug a chance was because they thought he would have been picked up by Vegas. Nonetheless, fans should be happy that Hudon is a strong candidate to make the roster this year. Again, the stunted growth and development of this player shows how Bergevin doesn’t seem that committed to the young players in the system and that Hudon making the team is a year or two too late. The second player I’m about to mention is a player that the majority of fans and analysts alike are split on. If you follow me on Twitter, you know I am a strong advocate for 22 year old Swedish power forward Jacob de la Rose. Unlike the rest of the minuscule semi-offensive spark plugs the Canadiens’ have in their system, Jacob de la Rose is the entire package for a team craving a fourth line center. His six foot three frame along with his speed are intangibles that a defensive minded coach such as Claude Julien would cater to. His reputation of being a defense first player allowed de la Rose to become Montreal’s temporary third line center after Lars Eller went down to injury. For a 19 year old, de la Rose could only do so much. He received an unfair amount of criticism because his stats weren’t typical of a third line center. That probably had something to do with the fact that he was starting nearly 70% of his time in the defensive zone. His first attempt at an NHL career could have gone better, but that’s mainly the fault of Michel Therrien for putting a player in such a vulnerable position at such a young age. It was difficult for de la Rose to translate his offensive prowess that he showed in the U-18 into his beginner years in the AHL. However, his 2016-2017 campaign in St. John’s was his most impressive offensively. He managed 31 points in 62 games. Obviously, there is still some room for improvement, but at least he is trending in the right direction. In the playoffs he was one of the Ice Caps’ best players tallying three points in just four playoff games. This training camp is make or break for de la Rose. The defensive center (if sent down) would have to go through waivers and at this point it’s almost a guarantee that he would get claimed immediately. There is virtually no reason Jacob de la Rose shouldn’t start the season as the team’s fourth line center. Torrey Mitchell isn’t worth the amount he’s getting paid, he’s erratic when he touches the puck, rarely makes a solid outlet pass and often overskates the play causing an odd-man rush the other way. There comes a point when a player can only develop so much, and in my opinion, Hudon and de la Rose have been lurking in the shadows of players who are overpaid and visibly less skilled than these two young guns. Should these two players make the team as Claude Julien has hinted, Montreal’s bottom six will be more productive offensively and defensively without sacrificing speed. Marc Bergevin without a doubt has actively made Montreal’s defence corps worse. Aside from the addition of Jeff Petry, Bergevin has made the back end deeper but with players who are older and slower while losing mobile puck moving players such as Mark Barberio, Mikhail Sergachev and Greg Pateryn. He replaced them with Jordie Benn, an older slower “defensive defencemen” who had an average regular season but was gassed once playoffs began. He overpaid for Karl Alzner, who is essentially Josh Gorges in his prime. Along with that, he signed veteran and former Canadien Mark Streit along with other “depth guys” Joe Morrow and David Schlemko. Marc Bergevin has made an effort to reshape and mold Montreal’s defence into players who play the way he did; with grit and character but with no real offensive upside. There is this ridiculous notion that the aforementioned players are better defensively than someone who can drive the puck out and push offence. This makes people question the term “stay at home defensemen”. It obviously means a player who spends time in his own end more than the other above average puck movers. Why is it that puck moving defencemen get labeled as risky and have defensive liabilities when they spend their time doing all they can with possession of the puck anywhere but their own end while the “defensive defencemen” spend their time coasting in their own zone playing on their heels? Back to the point of this article. Bergevin has never missed an opportunity to add and add and add depth defencemen rather than giving his prospects in the system a shot. With Sergachev off to Tampa, Montreal’s pool of defencemen isn’t as deep as it was. However, there are still players, such as Brett Lernout, who have done their time in the AHL who would benefit from getting a shot. Lernout has played just three NHL games since being drafted in 2014. Every camp, he demonstrates his strong defensive play with a little bit of offensive flare. He skates with poise, has decent speed and makes a good first pass. He has consistently been one of Montreal’s better defensemen within the system yet the Habs brass is hesitant to give him a chance. There are some positive signs that this year might be the year that some younger players make the jump. Unlike his predecessor, Claude Julien has experience developing young players, he understands the importance of communicating with them consistently and he knows how to use them. At the start of the summer, he mentioned how he wanted to see players from the AHL make the jump to the team, something Michel Therrien rarely, if ever, said. As said, Bergevin has never missed an opportunity to load up on size and grit by signing older players with limited offensive upside rather than giving chances to young players more deserving of a spot who languish in the AHL such as Charles Hudon, Jacob de la Rose, and Brett Lernout. Enough catering to the vets; it’s time for the young players to show what they can do. Young players can only develop so much and these players have spent more than enough time under Lefebvre. They deserve a roster spot. What do you think about Bergevin’s depth signings? Who should make the team out of camp? Let me know in the comments. 46 Bergevin trades since 2012. Take out Subban for Weber, deadline deal to bring in Petry. Leaves 44 trades of which two(2) trades to bring in Top 6 talent. Yes, Vanek and Drouin are the only two additions to the team’s most important scoring group. Yup that 42 trades to bring in lower tier players for the 3rd & 4th lines and the 3rd tier defenseman and bottom tier goalies. This was the areas of the team that Bergevin deemed to be the most important. Of course he didn’t reach that decision by himself. The ever astute Therrien played a huge role in that. So into Year 6 and he still doesn’t have a number 1 Centre or a bonifide puck moving defensemen or an actual plan to get this team into the SC finals. Just do the Math and you’ll get a very uncomfortable feeling where this team is going. I could have written this article a few seasons back. Well said and I totally agree. The wasted draft picks are becoming too common place. There are some draft years where we have “NONE” of the players selected with the team! Time to replace Marc and Trevor. The potential that was passed over is troublesome. I have a similar line of thinking, but not as aggressive as your view. I did not like Flynn, both he and Mitchell came from Buffalo who were bottom feeders at the time, but I’m happy about Mitchell. He’s done fairly well for a 4th line centre. Flynn was really streaky and would come up with 3 or 4 goals all of a sudden nothing for the rest of the year and his defensive side would drop (maybe he was playing hurt?). I think you’ll see Mitchell do better once the season starts. He gets hurt a lot and it looks like he’s making only a small effort in pre-season. The guys we got at the beginning of the playoffs (except for Ott)didn’t contribute much and god knows why he kept Martinson for another year. The defence is certainly not better than last year’s, but I’m willing to give them a chance, I think we’ll keep Eric Gelinas and possibly Schlemko and possibly another. Davidson could be good, but needs to go down for games. I like Mette and he may or may not stay up. The rest of those D (Redmond, Morrow, Streit) don’t know about them, not stepping up. 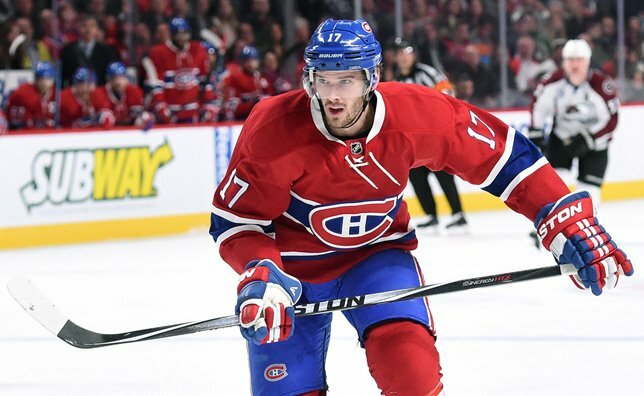 We hear Bergevin wants to save the bucks he’s got for a big deal (probably Duchesne) but if it doesn’t pan out he should get Markov back, we can’t get anyone of his skill on the present market. It seems to me to be early before anything should be decided as to team viability. They are just starting to put close to a full team on the ice. Any conclusions I feel should be kept until the end of pre-season and even about 5 games in.